Postural Alignment Therapy works through simple stretching and strengthening exercises to re balance the muscles of the body returning it to its natural alignment. When the muscles are balanced and the body is working as it was designed to you will feel an immediate reduction in pain and symptoms. Other benefits include standing taller, enhanced balance and improved performance. If you are suffering from back, neck, shoulder, knee or hip pain, rather than looking for activities, such as running, your job or lifting a heavy object as the cause of your pain, look at the body that you take to that activity. When we look at the human body it should have eight load bearing joints, shoulders, hips, knees and ankles, stacked over the top of each other with no rotation (twisting) and no elevation (one side higher than the other). 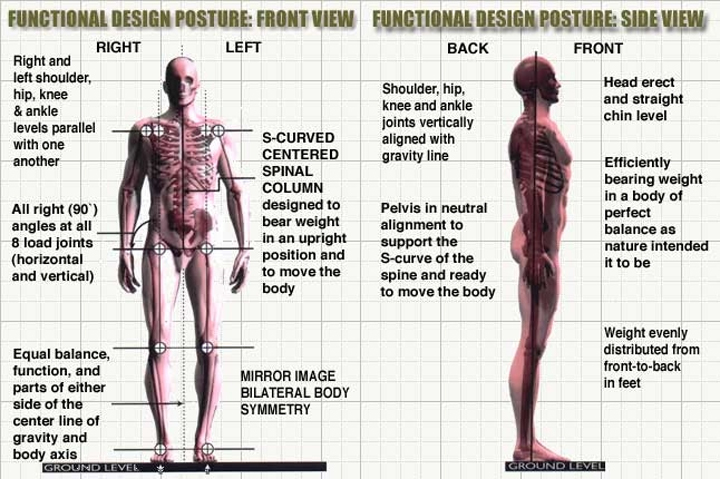 Stand in front of the mirror and see how well your joints are aligned in comparison to this diagram. When it is in the correct position loaded by gravity from above and ground reaction force from below your body is pain free with maximum strength, flexibility and power. You can run, jump, twist and turn easily, demanding activity and movement from your body with confidence and returning back to neutral. When you are moving your muscles are pumping like the pistons in your car engine and when you stop they return to neutral like your car parked in the drive. Your body is a unit and it always works as a unit. When one of the joints is moved out of alignment it affects all of the other joints throughout the chain. If you change the length and tension of one muscle group all the other muscles in the body have to reorganise themselves relative to this change of position. Other areas of the body have to take up the slack causing stress to the muscles and joints which are unevenly loaded resulting in wear and tear on the joints, injury to the muscles and pain which can be either acute or chronic. I start by assessing and mapping your static posture and correcting the misalignment by creating a bespoke programme of simple stretching and strengthening exercises which you will run through in the first session. Your programme with pictures and explanations is printed out for you so you can get going with your exercises the next day! You will see and feel the effects such as symptom relief and improved balance after the first session and then consolidate the results by doing the exercises regularly. This entrains the correct movement patterns into the body so that your movement is based on a stable platform allowing you to enjoy a pain free active lifestyle. By looking at the root cause of the problem, which is your posture, rather than focusing on the symptoms you will be given the tools and education about your body to find a long term, lasting solution to your pain. Feeling better. When your joints are aligned and your muscles are balanced you feel a reduction in symptoms and your body feels relaxed and centred allowing you to get on with your daily life. Improved performance. When muscles are at the right length and tension they have full flexibility, strength and power which you can then enjoy applying to your favourite activity or sport. Looking better. Correct posture gives you poise and even can give the illusion of losing pounds! With acute injuries the compensatory postural problems caused as a result of the injury are prevented. By keeping the body in correct alignment the stress is taken off of the damaged tissues allowing the body the conditions it needs to heal as quickly as possible. When you are forced to correct your postural alignment to rehabilitate an injury you are also dealing with the backlog of postural compensations you have been living with for years and that brought you to the point of injury. Therefore you will feel better after the injury has healed than you did before having improved muscle balance so that your body can perform more effectively while putting in less effort.